Dominating and looking over the Pacific coast of South Bay, the Seaward Kaikoura Mountain range (also known as the Kaikouras) raises gradually at first from the coastline to it's highest point of Mt Manakau (2610 metres). 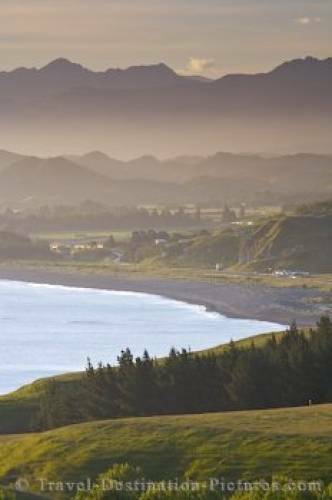 The rolling countryside between the mountains and sea is fertile farmland which surrounds the town of Kaikoura. The Kaikoura Peninsula separates South Bay from the beach and waterfront of the town itself and is where many water based tours depart from. South Bay of Kaikoura at sunset from lookout point along Shakespeare Road, Kaikoura, East Coast, South Island, New Zealand.